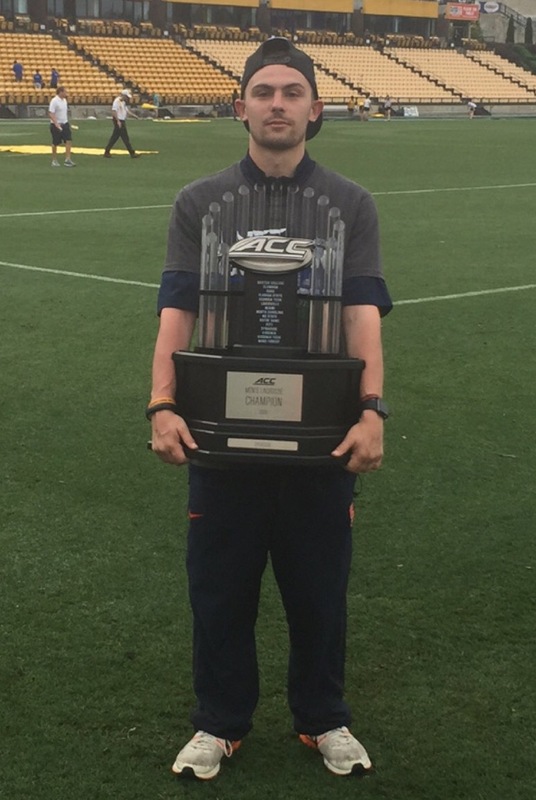 This past weekend, I was with the rest of the Syracuse Men’s Lacrosse team down in Kennesaw, Georgia for the ACC Tournament. 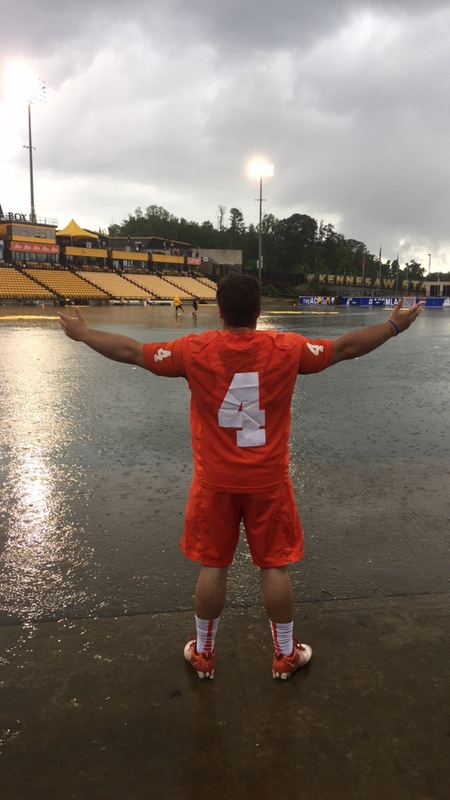 As you may know, the Orange defeated North Carolina 10-7 on Friday and then defeated Duke 14-8 to win their second straight ACC Championship. 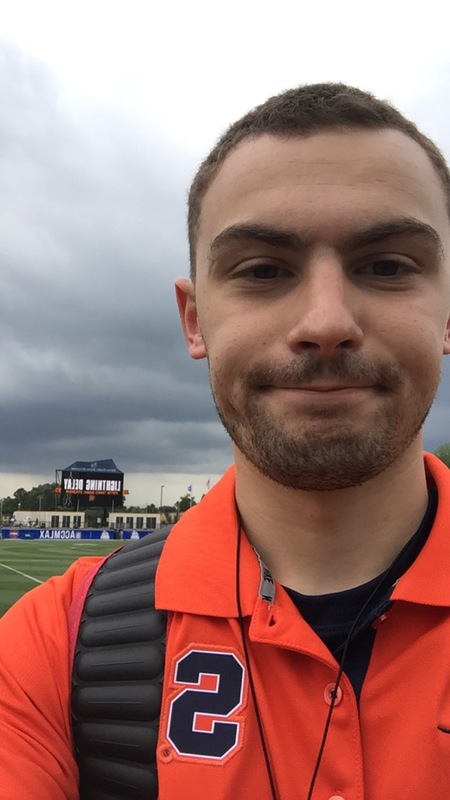 As you may also know, I am the team’s Video Coordinator, so I have some more access than most writers and reporters. During the weekend, we bonded more as a team on and off the field, culminating with our flight back home to Syracuse late Sunday night into early Monday morning. So what did we do between our flight coming into Atlanta on Thursday and our flight leaving on Sunday? That’s where I come in. After a two hour drive up to Rochester, we took off for Atlanta and had a smooth flight. 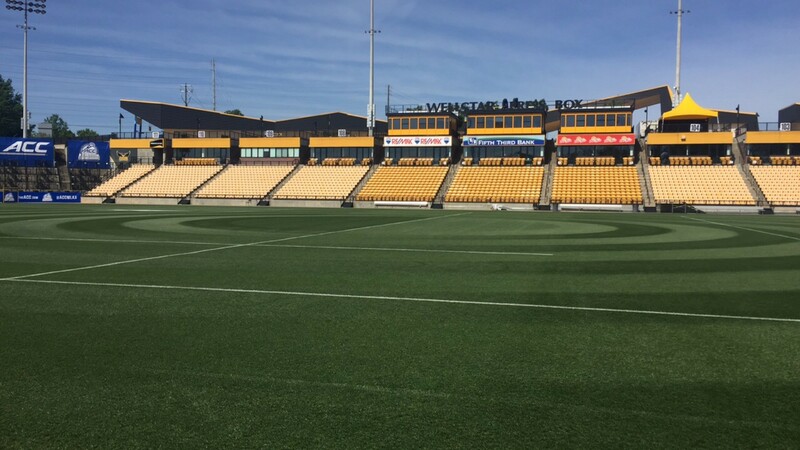 We got our bags off and we started to make our way to Fifth Third Bank Stadium for practice. It took us about an hour to get there from the airport, as we were stuck in traffic for about a good 30-45 minutes. We would get stuck in traffic multiple times throughout the trip, including the majority of Thursday and Friday, and getting back to the airport on Sunday. But we ended up at practice on time, and the field looked great. 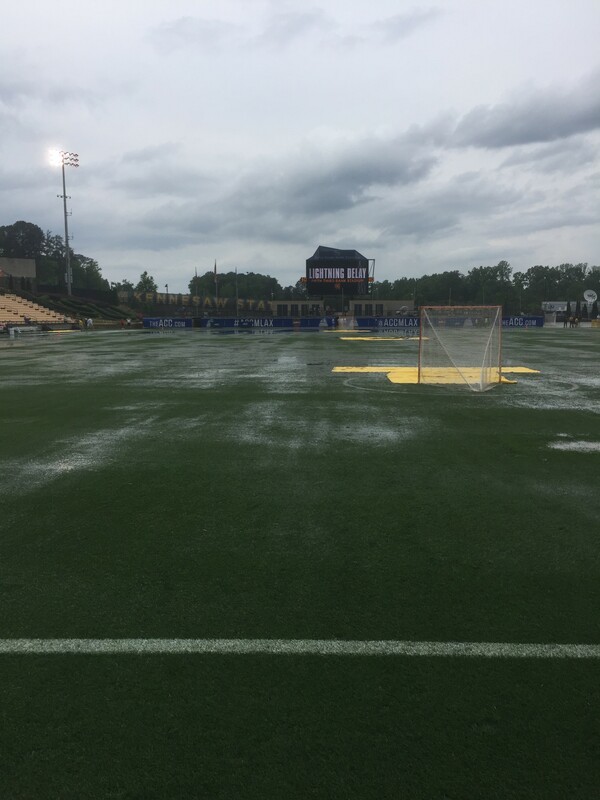 We came here last year to play St. John’s in the Cobb County Classic, so we were very familiar with how the stadium looked. We weren’t allowed to wear any cleats for the warm up, just turf shoes or sneakers. We were about halfway done our practice until our coaches decided in favor of another grass field since players were sliding a ton. We moved, players grabbed and wore their cleats, and we finished practice. After checking into our hotel, we ate at Maggiano’s nearby and returned to our hotel to call it a night. Some of us watched the NFL Draft, while others studied for exams, played video games, or slept. Our first of what we hoped was two gamedays this weekend. After breakfast, we went over to Kennesaw State University again for a smooth practice. All we did was stretch, throw the ball around, and a little bit of shooting. Our guys were very accurate with their shots in our two practices and were feeling confident. Back to the hotel we went, where we got ready to take on UNC. We left a little after our pregame meal, and were focused on the task at hand. The set-up was weird for the semifinals. Both teams had to cross midfield to get to their respective benches for the game from their locker rooms. So, Syracuse had the locker room closest to UNC’s side, while the Tar Heels had the locker room closest to Syracuse’s side. It was warm and in the upper 80s by opening faceoff. 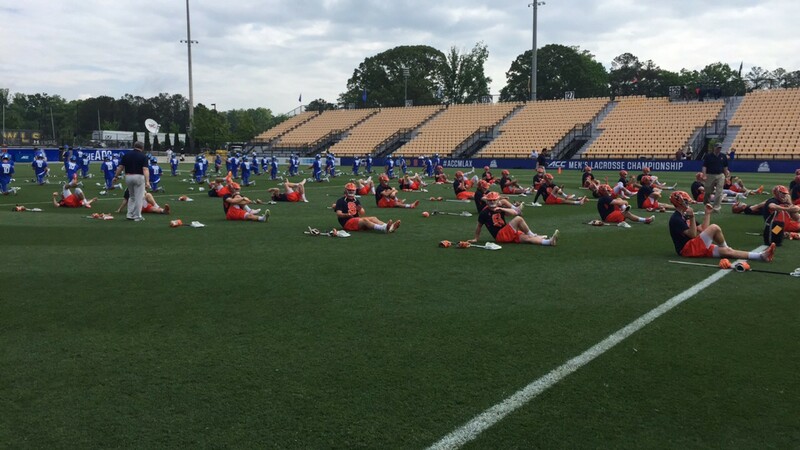 Syracuse won the game 10-7 and shut out the Heels in the first and third quarters. The Alpharetta boy Nate Solomon tied a team-high with two goals in the win, along with Derek DeJoe and Jordan Evans. 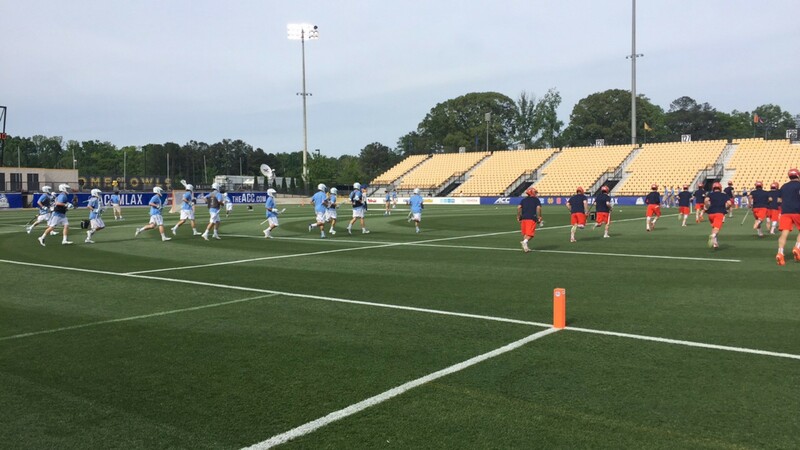 Nick Mariano scored once but dished out assists on three other scores, while the defense kept UNC held under double digits, as the Tar Heels committed 13 turnovers and were 17-of-20 on clears. Evan Molloy made 14 saves in the win. For UNC, Steve Pontrello had a hat-trick and two assists, while Brian Cannon scored a hat-trick as well. Brian Balkham made 12 saves in the loss. A great win, but we weren’t there to win one game and be done. We wanted that ACC Championship for the second straight year. Some of us went to our usual postgame tailgate with some of their parents and loved ones, while others decided to grab a quick bite and head back to watch the first half of the Duke-Notre Dame game. We got back to the hotel at the start of the final quarter, when we saw that the Blue Devils mounted a comeback to beat the Irish in overtime thanks to a goal by Justin Guterding. And so for another year, it’d be Duke and Syracuse in the ACC Championship. 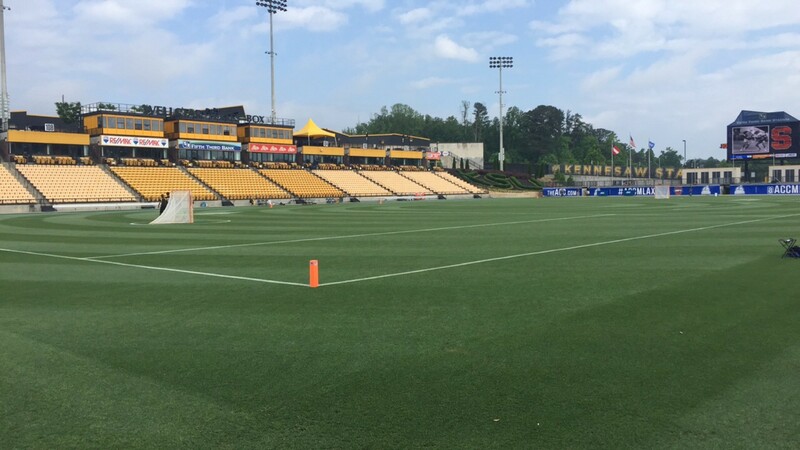 After breakfast, and running into some of the members of Brown’s team who stayed at the same hotel we were at, we went back to Kennesaw State and had a light practice on one of the grass fields. We headed back to the hotel and had a few hours of free time before our team dinner that night. Some of us ate at the hotel’s restaurant while watching the rest of the NFL Draft, Game 2 between the Islanders and the Lightning, or the Marquette and Denver game. For our team dinner, we went over to Solomon’s house, where his family graciously hosted us. We were treated to a food truck called The Loaded Burger, which had spectacular burgers. It felt like a high school graduation party, with many of us heading downstairs to their basement to play floor hockey and watch the Ohio State-Rutgers game. It was great team bonding, but we hoped that there would be more of that after the ACC Championship. One final weather check looked like the game would get in without any delays. 0% chance of rain until around 2 PM, with thunderstorms coming in around 5:45. Just like Friday, there was a ton of energy in the locker room before heading out for warmups. Unlike Friday, we were able to switch our locker rooms so that we had the larger one near our side of the field. Duke had first dibs, but did not want to move because they were superstitious. The game started, and it was balanced throughout in the first three quarters. Up to then, the Orange had an 8-7 lead over the Blue Devils, with Tim Barber and Nick Mariano each picking up two goals and an assist, while Sergio Salcido, Derek DeJoe, Dylan Donahue, and Joe Gillis also recorded goals. For Duke, Brad Smith had two goals on the second midfield, while Matt Giampetroni, Justin Guterding, Kyle Rowe, Jack Bruckner, and Myles Jones recorded goals as well. Jones’s tally with 4:12 left in the 3rd was his first point of the game. Nothing yet from Deemer Class, who scored seven times in the first meeting between the two teams. Barber and Jones scored again to make it a 9-8 game, and the Orange were just on a man-up with 7:10 left in the game. That is until we heard a rumble of thunder, and a few moments later, the game was halted by the ACC due to lightning being in an eight mile radius from the stadium. And thus, a nearly three hour long wait ensued. For about a half hour to 45 minutes, we didn’t hear any thunder, see any lightning, or see any rain. We could have finished this game if we didn’t care about safety. And then, the rain slowly started and started to pick up. And in a few short minutes, it looked like a scene from the Biblical story of Noah’s Ark. Loud booms of thunder, flashy bolts of lightning, and to cap it off, the monsoon! 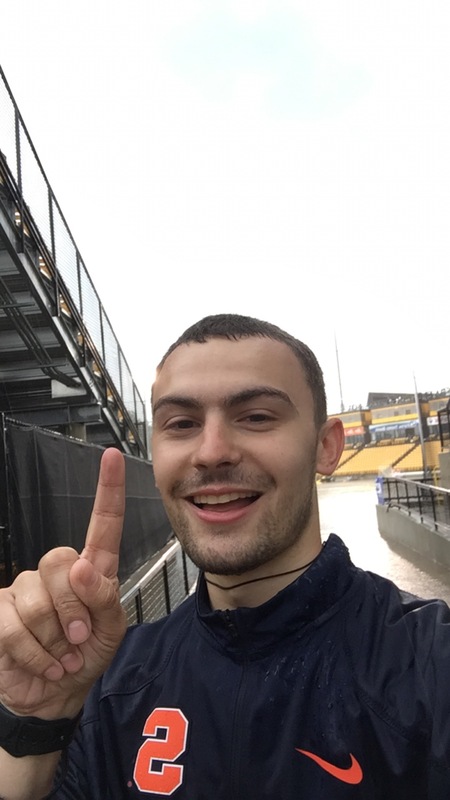 I was up top inside one of the press boxes when our coaches wanted their iPads to watch film of what happened, so guess who had to run through the monsoon, down the stairs that became two inch waterfalls, and through the flooded grass field? Me. After drying up, I went back outside and surprisingly really enjoyed the rain. I don’t know why, but I thought it was cool. A situation like this has never happened before for any of our coaches, and I don’t think this will ever happen again. I Periscoped near the end of the rain storm, when the thunder and lightning were away from our area, but it was still cool. 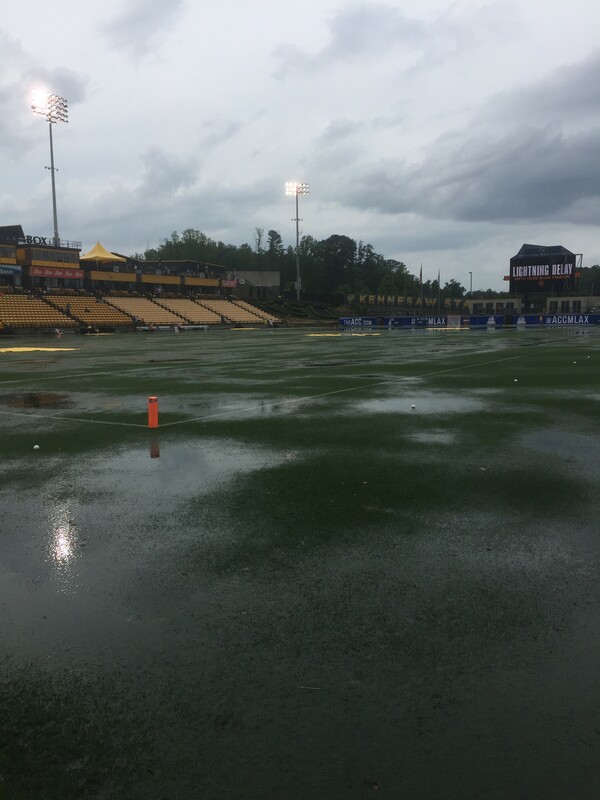 The rain slowed down, and then completely stopped. Around that time, we learned our alternatives. The first was to discontinue the game. If that happened, we would have won the ACC Championship. But, as we later found out after the game was over, we would not have won the AQ. That would have went to North Carolina, who finished 1st in the ACC regular season standings. Ridiculous, right? The second option was to finish the game on a turf field. 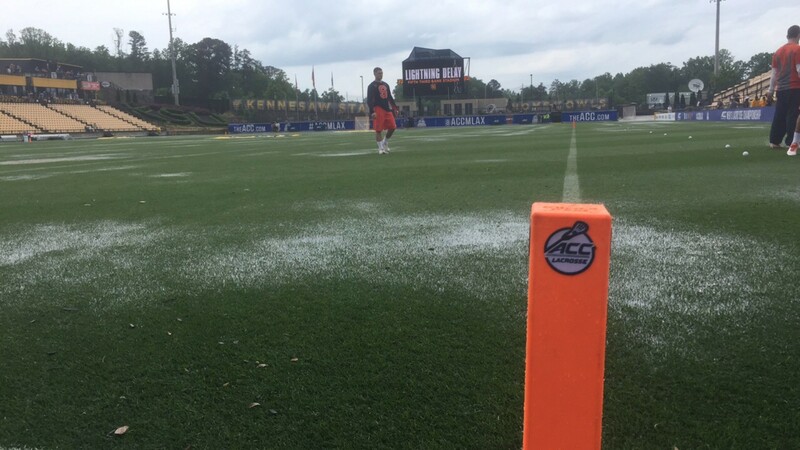 Because let’s face it, we weren’t going to play on this, right? 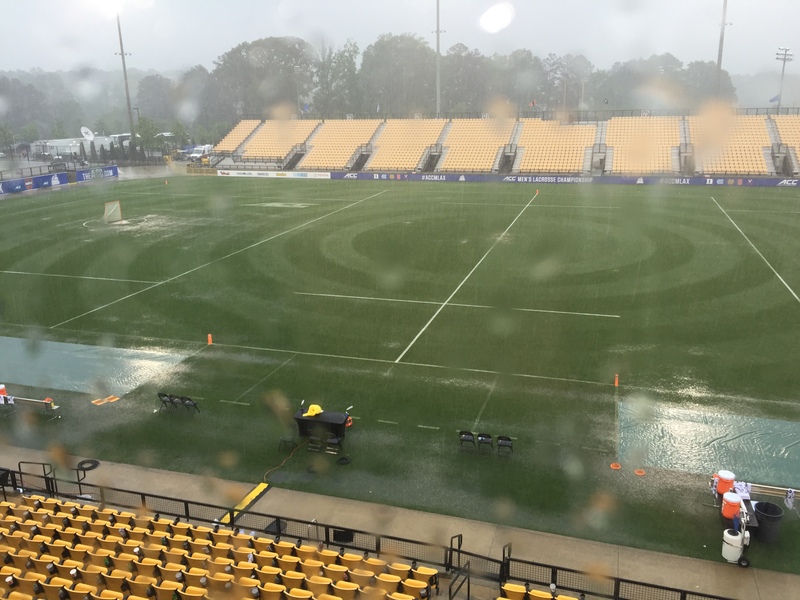 Kennesaw’s draining system at the field was spectacular, but with a rainstorm like this, it was too much to handle. 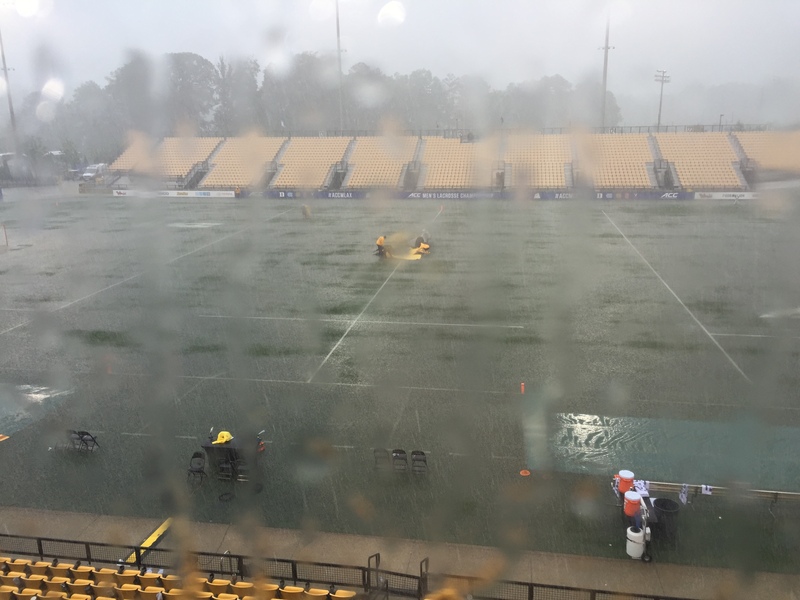 At around 4 PM, with half of the grass field without any puddles but still really soaked, the decision was made to move the game to a turf field. The game would start at 4:45, and nobody would broadcast the game. Syracuse’s student run WAER and Brian Higgins were able to call the game, but if you were watching on ESPNU, tough luck. We walked all the way over from our locker room to the turf field, which took about ten minutes total. Yet again, it felt like high school, with the long walk and the rain delay. But during that time, all of players ate a ton of candy, which has sugar in it. 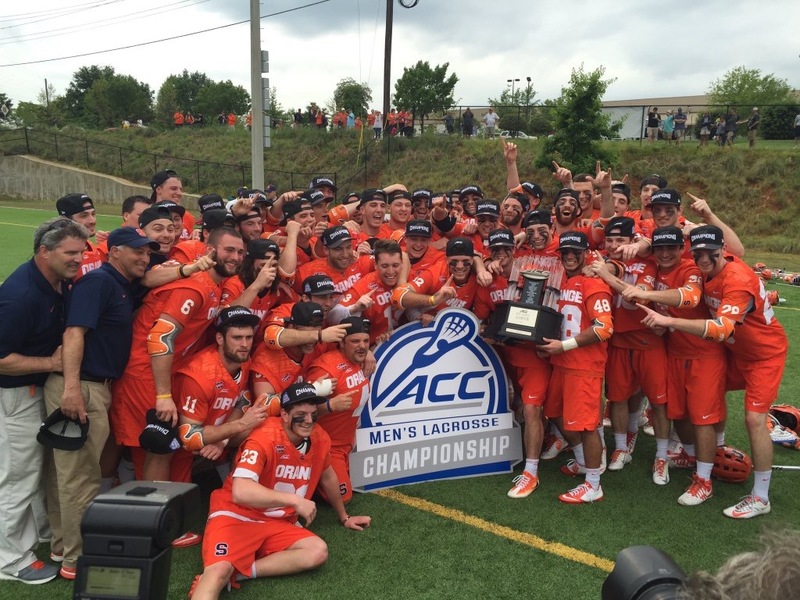 They were all on a sugar rush, and eventually went on a 5-0 run to end the game and win the ACC Championship 14-8. Goalie Evan Molloy was named Tournament MVP with 13 saves made in the title game after making 14 saves Friday night. New hats, new shirts, new trophies, same winning Cuse tradition! Trying to look tough with my hat backwards and showing off some HUGE ears! After another parent tailgate, we headed for the airport for our 9:40 flight. We got there with plenty of time, but we ended up not leaving until 11:30 due to Delta overbooking the flight by a few people and having a weight balance issue. They eventually solved the problem, and we got back to Cuse around 1 AM. I got back to my apartment at 2:15 AM and didn’t go to sleep until 3:15 AM. Yikes. First, about the games. Notre Dame doesn’t look like the Notre Dame we saw earlier in the season. UNC is still shaky. They can be really good one week and then meh the following. That might hurt their at-large chances. Duke might be starting to turn it on, but who knows if they would be able to beat Cuse if there was no lightning delay. And Cuse’s defense has looked so much better in past weeks. But those losses in the middle of the season might not have them host a game in the NCAA Tournament! The ACC is very different from last year. Second, about the weekend. I thought it was a great weekend to be around the guys, and play two of our best games this year. There’s still more work to do and plenty to improve on, but everything’s better when you win. Including the brutal sunburn I got on my right arm and my forehead!